As we move forward with our membership, we realize that members will potentially relocate and we will make sure to announce each member bonus shipping date and allow a window for members to update shipping addresses in case you have in fact moved. Please note: Any changes to your address made after Tuesday Oct 13, 2015 may not make it in before your batch is shipped. If you miss this deadline, please send an email to support@fpcore.com right away with you new address and be sure to include your username or order number. 2. 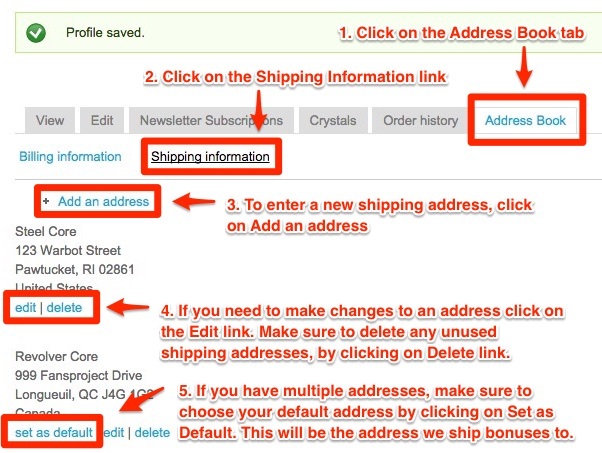 Navigate to the "Address Book" tab and click on the "Shipping Address" Link. 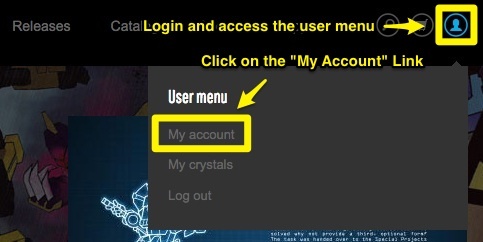 From there, you can add an address by clicking the "Add an address" link. Make sure to delete any unwanted addresses using the "delete" link under the address. Use the "edit" link to correct any existing addresses. If you have multiple addresses, make sure to click on the "set as default" link under the address that you want us to send member bonuses to.